the transfer of living organs or tissue from one part of the body to another or from one individual to another. Transplantation and grafting mean the same thing, although the term grafting is more commonly used to refer to the transfer of skin. In dentistry, transplantation refers to the insertion into a prepared dental alveolus of an autogenous or homologous tooth; it may be a developing tooth germ from the same mouth, or a frozen homologous transplant. Occasionally an emergency requires an organ to be transplanted from one place to another within the body. Kidneys, for example, have been relocated to enable them to continue functioning after the ureters have been damaged. Transplantation of an organ within the body, known as autotransplantation or an autologous graft, requires delicate surgery but otherwise poses no particular problem. Eye surgeons have developed the procedure called corneal transplantation or keratoplasty, in which part or all of a diseased cornea that has become opaque is removed and replaced by healthy corneal tissue from an eye bank. Cartilage and bone are other tissues that are not difficult to transplant from one individual to another. Cartilage is particularly able to be made into various shapes and so is widely used in reconstructive surgery. Bone grafts are sometimes used instead of metal plates in operations to repair fractures, and they can also be used to replace diseased bone. Grafts made of synthetic materials may also be used, such as Dacron vascular grafts that replace parts of blood vessels. Kidney transplants have been performed on dogs since 1902, but remained in the experimental realm in humans until a ground-breaking operation was performed in 1954 in Boston. A kidney from one identical twin was successfully implanted in the other to replace his diseased kidneys. Since that time kidney transplantations have been the most successful of transplantations, primarily because there are artificial kidney machines available (see dialysis and hemodialysis), and also because the kidney is a paired organ. This means that the donor need not be cadaveric but can be a living person (such as a relative of the recipient) and can be selected on the basis of tissue-type compatibility to avoid fatal rejection of the organ by the recipient. In 1967 the South African surgeon Christiaan N. Barnard transplanted a human heart. Transplants of hearts and other vital organs are now being done at an increasing rate throughout the world. There are ethical and legal implications of obtaining healthy organs for transplantation, which still have not been completely resolved. Rejection. The major problem to be overcome in transplantation therapy is rejection, an immune phenomenon. Organs such as the cornea, skin, and bone can be transplanted successfully because, in the case of the cornea, the vascular supply is not involved, or, in skin and bone, the transplant serves as a structural foundation into which the new tissue grows. In the case of intact organs such as the kidney, heart, lung, liver, and pancreas, a generous blood supply is essential to their survival in the recipient's body. The blood of the recipient carries in it many of the tools used by the body in defense against foreign substances. As blood is drained from the transplanted organ into the host's general circulation, the body recognizes the transplanted tissue cells as foreign invaders (antigens) and immediately sets up an immune response by producing antibodies. These antibodies are capable of inhibiting metabolism of the cells within the transplanted organ and eventually actively cause their destruction. They also play a role in delayed inflammatory response that can occur as late as weeks or months after implantation and adds to the destruction of the donor organ. In order to minimize rejection and improve the chances of survival of a transplanted organ, efforts are made to match as closely as possible the blood types and tissue types of the donor and recipient. First, the blood is tested for ABO or blood type compatibility. Then, tissue typing is done to identify the protein antigens that are specific to each individual. These antigens are the hla antigens (HLA), so called because they are easily identifiable on leukocytes. The more compatible these antigens are between donor and recipient, the less likely tissue rejection will occur. A third test that is done is crossmatching, which involves mixing the intended recipient's serum with lymphocytes from the potential donor. A positive reaction would show destruction of the donor's cells by antibodies in the recipient's serum, thus eliminating the possibility of using an organ from that particular donor. The probability of survival of a transplanted organ is highest when the donor is a sibling who is HLA identical to the recipient. Control of the immune response in the recipient is attempted by the use of immunosuppressive agents such as antilymphocyte globulin and antimetabolites, which tend to suppress the growth of rapidly dividing cells, and cyclosporine, which inhibits T-cell function. corticosteroids also are used because of their antiinflammatory effect. All of the chemicals used in transplantation therapy interfere in some way with the body's normal defense mechanisms. For this reason a delicate balance must be maintained in their administration so as to avoid tipping the scales either in the direction of rejection of the organ on one side or a fatal infection on the other. Heart transplantation. From Ignatavicius and Workman, 2000.
allogeneic transplantation transplantation of an allograft; the three types are cadaveric donor, living related donor, and living unrelated donor transplantation. Called also allotransplantation. bone marrow transplantation the intravenous infusion of bone marrow; the marrow may be autologous (from a previously harvested and stored self-donation) or allogeneic (from a living related donor or a living unrelated donor). Used to treat malignancies such as leukemia, lymphoma, myeloma, and selected solid tumors, as well as nonmalignant conditions such as aplastic anemia, immunologic deficiencies, and inborn errors of metabolism. cadaveric donor transplantation allogeneic transplantation of an organ or tissue from a cadaver. corneal transplantation transplantation of a donor cornea into the eye of a recipient; see also corneal transplantation. heterotopic transplantation transplantation of tissue typical of one area to a different recipient site. living nonrelated donor transplantation living unrelated donor transplantation. living related donor transplantation allogeneic transplantation in which the donor and the recipient have a close biological relationship, such as that of a parent and child or a brother and sister. living unrelated donor transplantation allogeneic transplantation in which the donor and the recipient do not have a close biological relationship. 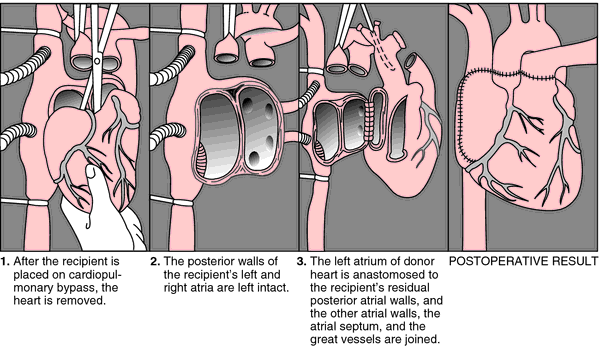 orthotopic transplantation transplantation of tissue from a donor into its normal position in the body of the recipient. syngeneic transplantation living related donor transplantation in which the organ or tissue is a syngraft; called also isotransplantation. xenogeneic transplantation transplantation of a xenograft; called also heterotransplantation. allogeneic transplantation of an organ or tissue from a cadaver.